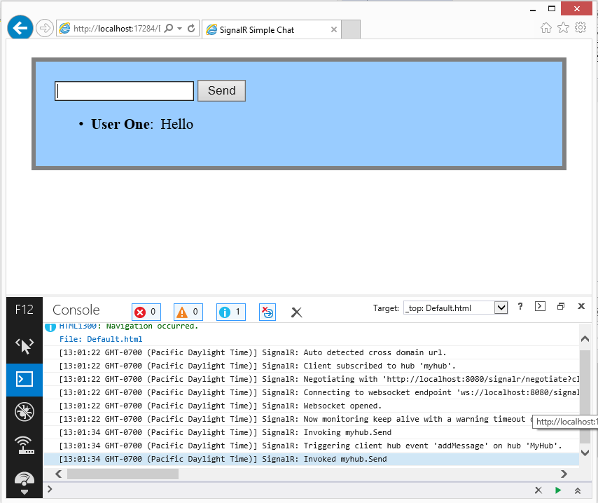 This document describes how to enable and configure tracing for SignalR servers and clients. Tracing enables you to view diagnostic information about events in your SignalR application. This topic was originally written by Patrick Fletcher. 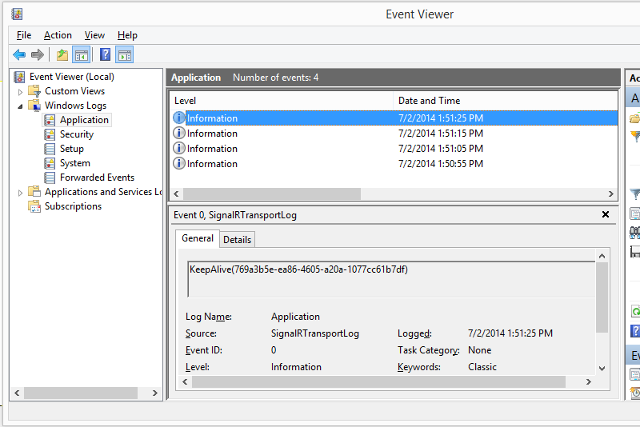 When tracing is enabled, a SignalR application creates log entries for events. You can log events from both the client and the server. Tracing on the server logs connection, scaleout provider, and message bus events. Tracing on the client logs connection events. 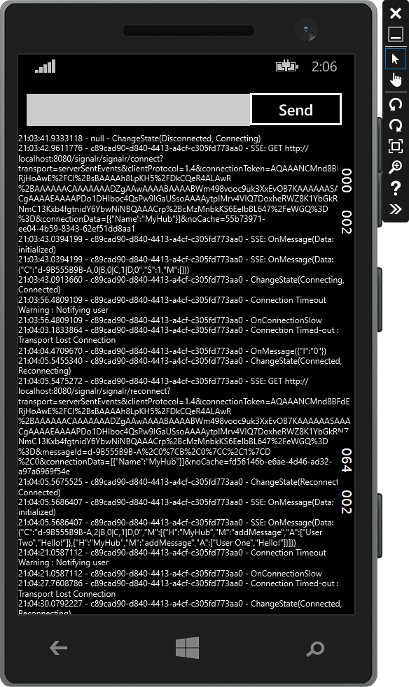 In SignalR 2.1 and later, tracing on the client logs the full content of hub invocation messages. You enable tracing on the server within the application's configuration file (either App.config or Web.config depending on the type of project.) You specify which categories of events you want to log. In the configuration file, you also specify whether to log the events to a text file, the Windows event log, or a custom log using an implementation of TraceListener. The following code shows how to enable tracing for each category of event. This sample configures the application to log events to text files. In the code above, the SignalRSwitch entry specifies the TraceLevel used for events sent to the specified log. In this case, it is set to Verbose which means all debugging and tracing messages are logged. The following output shows entries from the transports.log.txt file for an application using the above configuration file. It shows a new connection, a removed connection, and transport heartbeat events. SignalR.Transports.TransportHeartBeat Information: 0 : Connection 9aa62c9b-09b3-416c-b367-06520e24f780 is New. When using the event log, set the TraceLevel to Error to keep the number of messages manageable. The .NET client can log events to the console, a text file, or to a custom log using an implementation of TextWriter. To enable logging in the .NET client, set the connection's TraceLevel property to a TraceLevels value, and the TraceWriter property to a valid TextWriter instance. SignalR applications for Windows Phone apps use the same .NET client as desktop apps, but Console.Out and writing to a file with StreamWriter are not available. Instead, you need to create a custom implementation of TextWriter for tracing. To enable client-side logging on a connection, set the logging property on the connection object before you call the start method to establish the connection.